I’m going to challenge YOU to not only be challenged by a “challenge”. Be challenged by the need, by the ignorance, be challenged by the belief. Be challenged by the desire to empower and improve the lives around you, and your own, because they need be improved. Be challenged by the inherent hunger and thirst to be satisfied by the fullness of love and care and just. Be challenged by the hope of things to come, that are more aligned and affixed to the bounties of YOUR heart. Be challenged by YOUR reflection, by reflex, an automatic assertion towards a forward progress, exampling and exemplifying a habit and protocol of whatever it is that YOU are so “challenged” to be or do. Do not only be “challenged” to charity, or care, or benevolence, or compassion, or mercy. Not just for a cause, but because, BE-CAUSE! I challenge YOU to not need a “challenge” to do better, or more, or right, but to do these things because YOU must. 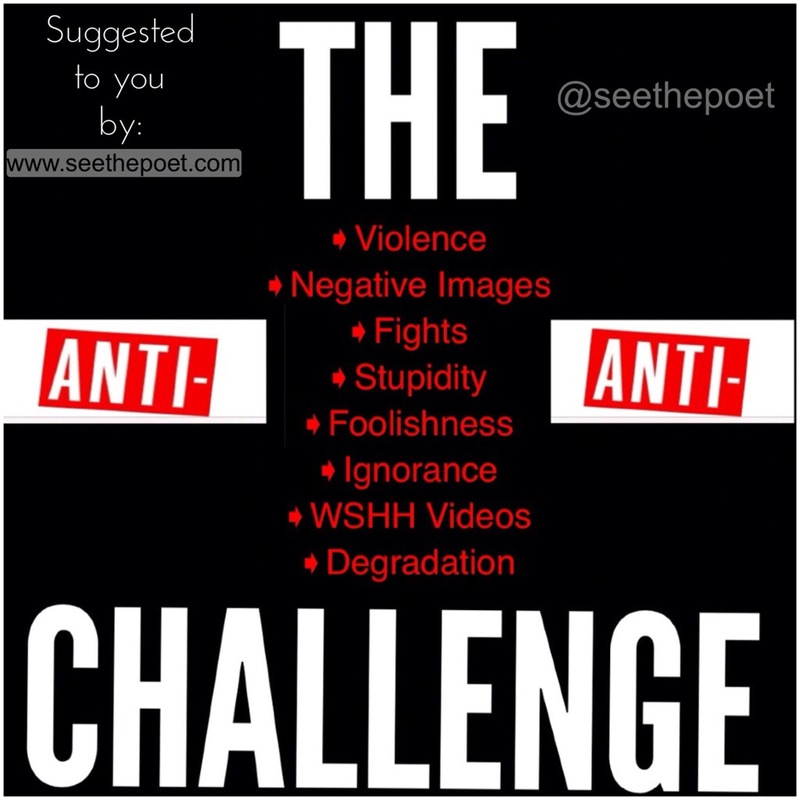 Because without doing these things YOU in effect challenge our progress beyond necessary. YOU challenge the orders and systems of good and compassion, with the selfishnesses of greed and ugly. YOU challenge evil for mere moments, to satisfy YOUR ego and YOUR pride, for sake of appearance, or popularity. I challenge YOU to compel the most inner of YOUR spirit to free from the sanctum of idleness and independence out into the labor of work and necessary that MUST BE DONE in order to service a most greater need and much bigger picture. I challenge YOU to secretly and quietly GO BODLY into the bowels of generosity and kindness and pull from there YOUR motive. I challenge YOU to be small, if so as to be sure. Let YOUR giving be cents if it can be consistent. Because strayed, stranded, and spread out BIG dollars, mean absolutely the least if not to be counted upon, or depended upon, or brought to pass. I challenge YOU to volunteer, consistently. To promote life and peace, consistently. To speak these things, consistently. Because YOUR greatest challenge is to be consistent. To be a flagship. To be the unnerved lighthouse along the most rigid of coast. Illuminated for even the most insignificant of ships. To be an example to the least of YOUR expect. To awake every morning and retire every night, challenged, to keep doing all and everything that YOU must to make things better. For all, for YOU. And YOU shouldn’t have to be challenged to do that. This entry was posted in Inspiration, Love, Motivation, Poetry, Quotes, Reflection, Self-Love, Uncategorized and tagged Challenge, Perspective, seethepoet, Truth, You on June 12, 2014 by seethepoet. Until you face those things that require YOUR attention, those things that YOU try to ignore, to hide, to imagine never existing, those things that have scared YOU and scarred YOU, physically or invisibly, emotionally and psychologically, and limited YOU and haunted YOU, until YOU turn to those things with even the smallest bit of courage and say, “I’m not afraid of YOU anymore”, until YOU do that, YOU will run, YOU will hide, YOU will hurt. Until YOU confront those things, until YOU say the things out loud that YOU imagine saying in YOUR head, until YOU free YOURSELF from the captivity and trap that has continually imprisoned YOU, until YOU unlock the cage that holds YOU hostage to whatever or whomever that thing is, until YOU set YOURSELF free , until YOU take back control of that part of YOU from whoever or whatever has its stronghold on YOU. Until YOU admit that what has happened and been done, has actually happened and been done, until YOU forgive YOURSELF for doing what YOU may feel makes YOU responsible or either not doing what YOU could have or should have done that YOU believe could have changed or made things different, until YOU admit that there was either nothing YOU could do or that YOU did all that YOU could. Until YOU release YOURSELF from feeling responsible for someone or something that happened out of YOUR power, until YOU realize that whatever happened has only the power that YOU give it to continually overpower YOU into submission and subjection to the guilt or shame or defeat that continues to cause YOU devastating and destructive consequences. Until YOU forgive that person or that thing or that energy that did what was done to YOU, until YOU let go of the part of what happened that steadily reminds YOU of the pain and always takes YOU back to that moment, a moment in time that YOU were probably nowhere near and had no way to prevent. Until YOU let all of that go, by acknowledging it, accepting it, and assuring YOURSELF that YOU can only move on, that YOU need to move on, that YOU have to move on or YOU will suffer in the place where YOU have been stuck, in the fear that YOU have been stuck in, trying to avoid life for fear of reliving some bad thing or things that YOU made it through but have yet to realize. Until YOU realize that what YOU do have is the power to take back YOUR life and the power to live that life happily and peacefully and free of the weight that is yesterday’s and serves no purpose for tomorrow. Until YOU face the person in the mirror that holds the key to YOUR survival and relieve them of the duty to hold onto pain, until YOU look in those eyes, in the mirror, and say, and mean, “I forgive YOU. I love YOU. YOU mean the world to me”, until YOU do that YOU will circle in mediocrity and mayhem and mischief and manipulation that only makes it harder to deal with YOURSELF. Until YOU deal with YOURSELF and take back YOUR power, and move on the way that YOU need to, until YOU do what is necessary, YOU will do nothing. All that will come of YOU will be nothing, and all that comes out of YOU will be nothing. And it will mean nothing to YOU until something is done. YOU have to discover what YOU need to do in order to get YOU back up, from the fall, from behind, from in the hole. YOU have to get the help that YOU need, and the support that YOU need and until YOU do, all YOU will ever do is need. And YOU will never fill the void of that need. Not until YOU want to be better and want to do better because YOU know that what YOU are doing is not healthy. Not until YOU face what made YOU sick. Not until YOU do what needs to be done to get better. And once YOU get to that point, YOU have a long way to go but YOU are going in the right direction and where YOU are going is up to YOU and is YOUR choice and has no limit or restriction. YOU can choose YOUR way and how fast YOU decide to get there. YOU get to dictate the terms on which YOU are living and YOU get to do that on purpose! YOU get to smile and YOU get to enjoy everyday full of the energy that is capable of embracing the surprises and unknowns of what life is about. YOU get to be bold in the face of whatever challenge or challenges, or circumstance arises. YOU get to face the inevitability of adversity with a will and willingness that protects YOU from being broken or bewildered as YOU had been before. YOU get to live. YOU get to love. YOU get to come out of hiding. YOU get to step into the light that was always there but just invisible to YOU as YOU functioned in darkness. YOU get the final say on how YOU react to life. YOU get to be proactive and deliberate and intentional. And no one or no thing will be able to take anything away from YOU. Not unless or until YOU say so. This entry was posted in Uncategorized and tagged Challenge, Fear, Overcome, Perspective, Release, seethepoet, Truth on September 17, 2013 by seethepoet.